In the far reaches of northeastern India, amidst the tall mountains of Sikkim, our 4 x 4 jeep had broken down, leaving us stranded in the town of Chungthang while we awaited alternative transport to continue our tour of the once-independent Buddhist state. The date was May 22, 2008 and Cameron's curiosity was piqued when I mentioned I made money from my travel blog. It was a common reaction, so I shared how blogging about my travel experiences translated into dollars in my pocket. I first met Cameron in Kathmandu, through Natalie and Sarah, who'd been on my 3-day rafting trip the week before. I looked up to him for many reasons, and not just because he was taller than me. Cameron had left Australia some 16 years earlier and set up an export business in Mexico with his sister. He traveled all of Latin America, and at some point along the way, became a yoga instructor. His true passion, however, was hiking. And we're not talking about day trips in the Adirondacks. Cameron's the kind of guy who'd already spent a few months solo hiking the entire Pacific Crest Trail from Canada to Mexico. When I met him, he was working his way through the hikes in the Lonely Planet Himalaya guide. 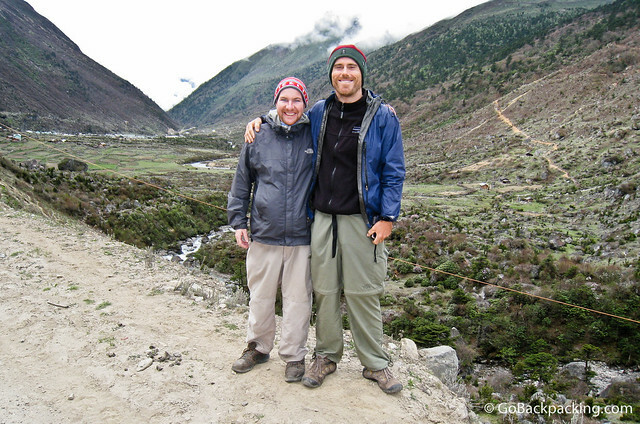 In Nepal, he'd completed the Annapurna Circuit and Annapurna Sanctuary hikes. After Nepal and India, he hiked in Pakistan, Iran and the Atlas Mountains of Morocco. A year or so later, he traveled overland from London to the Bearing Sea (Russia's east coast). I knew enough about Cameron on May 22, 2008 to know he could put together an awesome, authoritative blog on the topic of hiking. Over the years, we stayed in touch, and he'd ask web-related questions via email between his epic journeys. All is good in this part of the world. As of a few days ago, my website finally became officially operational! Over the past year I have spent more time in front of a computer than I ever imagined I would. It has been a steep learning curve. It feels good to have finished. The project turned out to be much bigger than I originally expected…………….the “War and Peace” of outdoors websites! I just wanted to say thank you for your encouragement and advice. I still remember that initial “website” conversation by the roadside in Sikkim. I immediately checked out his new site, The Hiking Life, and sent my congratulations. I was excited that he saw his vision through to fruition. And if he weren't traveling off-the-grid for months at a time, I'm sure he would've created a blog instead of a normal website. Regardless of the format, the site details a lifetime of hikes around the world, including his photos from each, and offers advice on everything from gear to safety. Outdoor enthusiasts and hikers can now benefit from his knowledge and first hand experience, plus I'm positive he could sell advertising, or obtain sponsors if he so desired. Traveling and living abroad the last three years, I've met a lot of interesting and inspiring people. Far too few have blogs to share their unique perspective on the world. I continue to believe with every ounce of my blogger being that once travelers realize the possibilities and opportunities that can arise from sharing their knowledge and experience with the world, more people will take the time to create their own independent sites. I created Travel Blog Success in 2010 to help people like Cameron build amazing websites. Over the last few months, I've doubled the community's resources to help newbies and experienced bloggers alike. Travel Blog Success re-opens to new members at 8 AM (EST), Tuesday March 22. If you're passionate about travel, I hope to see you in there! I like hiking too, because we will never miss the landscapes on the road. It seems that your route can be done with bicycles, that’s what I am always do. Only hiker and challengers have chance to see the realy beautiful natural things. If a travel is not done like this, we waste lots time sleeping in the bus.